We’re excited to introduce our newest #AgentSpotlight on Tarpey Insurance, who will be celebrating their 40th anniversary this year! A family owned and operated business, Tarpey Insurance Group, Inc. has been under the ownership of James J. Tarpey since 1979. Jim started out as an underwriter and now has over 60 years of insurance industry experience. 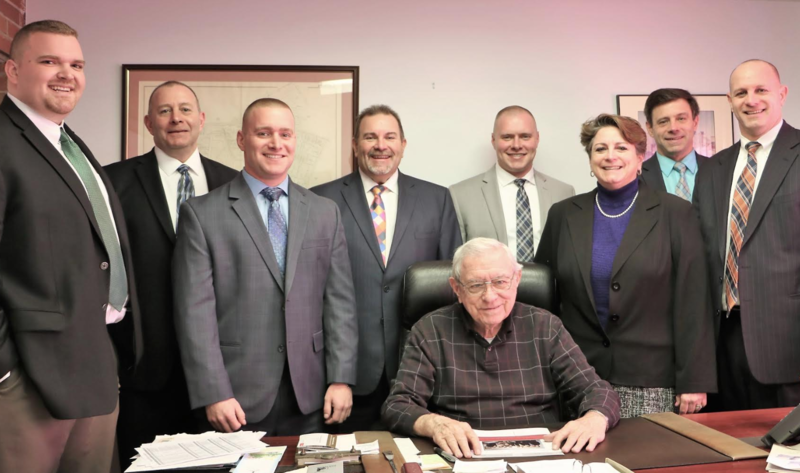 His children followed in his footsteps and now all five — Mike, Liz, Jim, Mark and Stephen — are a part of the Tarpey Insurance team. Keeping with the family tradition, four of his grandchildren have also joined the agency, making it ten family members working in the Tarpey offices all together, including Jim who’s still actively working out of their main office in Wakefield. Outside of the insurance industry, Tarpey Insurance strives to be not only active in, but also a positive influence on their community. For the past five years, they have organized Patriots dress down days – allowing employees to wear Patriots gear to the office in exchange for a $5 donation. Tarpey then matches the money raised by employees and donates these funds to local food banks. In addition to this effort, for over 20 years now they have organized a field goal competition during the annual Thanksgiving Day football game between rivals Melrose and Wakefield — the winner receives a $10,000 prize for making a field goal.